But Netanyahu and his ally, extremist Sheldon Adelson, are twin wrecking balls. Something might actually be happening in the Middle East, that is, on the Israel-Palestinian front. It’s not an area that’s usually visited by The Dreyfuss Report, because it seems permanently stalemated and stuck. (We’re talking decades here.) But Secretary of State John Kerry might be up to something. So I’m willing to suspend my skepticism and disbelief for a few months. 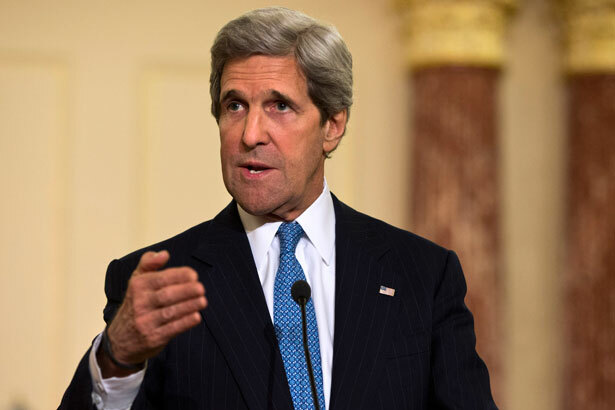 Secretary of State John Kerry has seemed perpetually in motion in the Middle East since he assumed office, shuttling from one meeting to another with top Israeli and Palestinian officials over the last four months in an effort to revive peace negotiations. He has divulged few details, and his overall strategy is unclear. But it would be foolish to write off his peacemaking diplomacy, as some have. So far, he seems to be moving in a determined and encouraging fashion on a series of interlocking steps. And I agree, it would be foolish to write off what Kerry is doing, especially since President Obama has been hinting—ever since his “listening and learning” visit to Israel and Palestine this spring—that he may be thinking about putting forward a peace plan of some sort. Indeed, Kerry has been a one-man sandstorm in the Middle East, constantly meeting Israeli and Palestinian officials, and this week—in connection with an Israel-Palestinian group of capitalists called Breaking the Impasse, and in conjunction with a billionaire friend of Kerry’s, Tim Collins, and the World Economic Forum—Kerry put forth a plan to gather $4 billion to rebuild and revitalize the economy of the occupied West Bank. However thick the insulation, it is doubtful it can withstand the test of time or the pressures of mounting frustration. Many conditions for an uprising are objectively in place: political discontent, lack of hope, economic fragility, increased violence and an overwhelming sense that security cooperation serves an Israeli—not Palestinian—interest. At some point—and triggered by an unexpected event—Palestinians may well decide their long-run well-being would be better served by instability, and only by rocking the boat might they come closer to their desired destination. The result likely will differ from the second intifada, as the second differed markedly from the first. But short of steps to unify and reinforce the legitimacy of Palestinian institutions and move Israelis and Palestinians toward a comprehensive peace, another destabilizing event sooner or later is inevitable. In buying time, aid dollars go only so far. At first glance, it might seem like the Kerry plan is an updated version of the idea, supported by Benjamin Netanyahu and Co., to freeze the political part of the peace process while allowing the Palestinians to improve their economic standing. But both Kerry and the others involved say that’s not the idea. The group, calling itself Breaking the Impasse, has met more than 20 times in the past year and includes about 300 executives of high-tech, construction, beverage and insurance companies, as well as banks, and many Palestinian investors from abroad. Representatives of the group said they met on Thursday with Prime Minister Benjamin Netanyahu of Israel and have also met with President Abbas. The two leaders of Breaking the Impasse, Yossi Vardi of Israel and Munib al-Masri of Palestine, seem to agree that not only economics but politics has to be involved, and Masri supports the notion of two-state solution based on the 1967 borders and an Arab capital in Jerusalem. Earlier this year, of course, Kerry pushed the Arab League to revamp and reissue its 2002 Arab Peace Initiative. I’m the last to overestimate how difficult it will be make any progress here, absent a willingness by President Obama to push Israel, hard, to make the deal. Interested in more coverage of Israel and Palestine? Read Anna Lekas Miller’s report on settlements in East Jerusalem here.